MARK (1, 2 or I, II... etc. ), Pattern, Type etc. - Société pour le sport et la technique, organisation paramilitaire d'encadrement de la jeunesse dans l'ancienne RDA, créée en 1952, comparable au Jungendienst de l'entre-deux guerres. - Fabricant, n° de série du fabr. 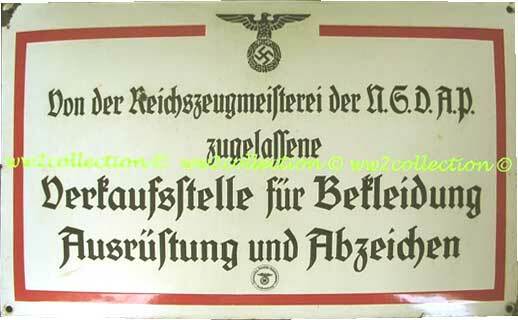 - In Nazi Germany, former department similar to the Quartermaster Office (see Reichszeugmeisterei in engl. 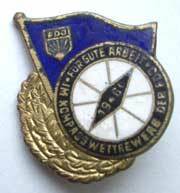 WIKIPEDIA) supervising the design of nazi party NSDAP materiels. 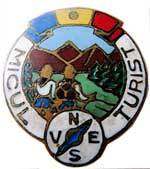 USGS - United States Geological Survey (link leading to the USGS website and history), establ. July 1,1879. - Autorité étatsunienne corespondant à l'IGN créée en 1879 (le lien renvoie à son site, chapitre histoire, en anglais). CLICK HERE TO OPEN THE GLOSSARY TABLE - in the table below: use the short-cut Ctrl+f (Windows) or Apple+f (Mac) and write the desired word in the search window. You will also find more information about some of the following terms in the online encyclopedia Wikipedia. The Canadian governmental translation office Termium offers many translations and definitions in French, English and (partly) Spanish. The international standard ISO 1069 gives definitions in English and French. Taschenuhrgehäuse mit Klappdeckel. Kann federbelastet sein (öffnet nur bis 90 Grad) oder ohne Feder (öffnet bis 180 Grad). Hunter-type case. There are two systems: spring hunter and snap hunter. The spring hunter opens by depressing a push-button. 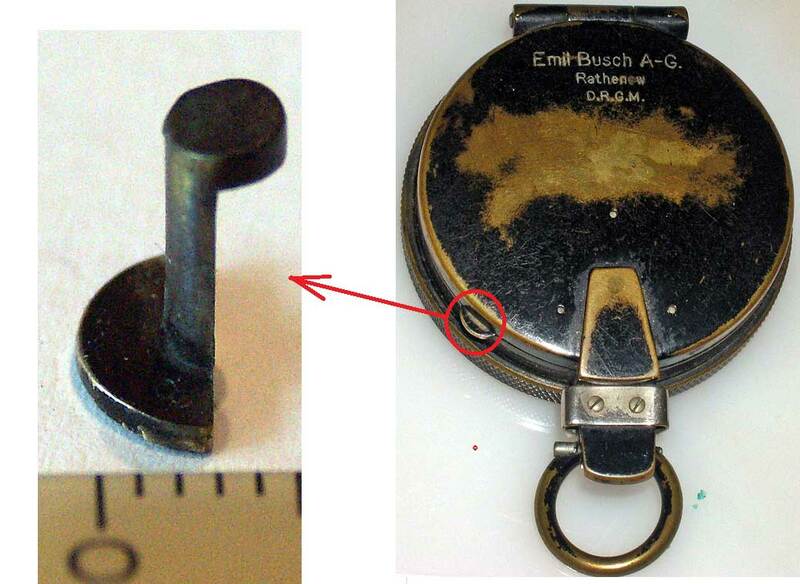 A snap hunter has no spring, the lid must be opened manually and opens and closes with a “snap” lock. The benefit of the snap cover case is that there is no possibility of straining the hinge pin. The compass case can comfortably be opened to a 180 degrees without a problem. A half hunter has a window with a magnifying glass. 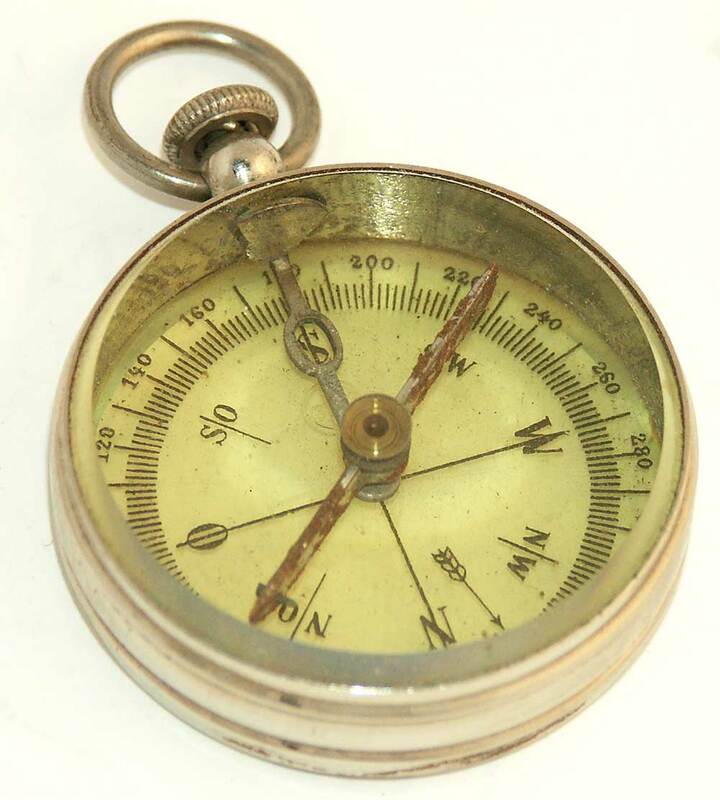 Pocket compasses without cover are called open-face. Savonnette. Boîtier de montre de gousset à couvercle articulé. Existe avec ressort (ouverture limitée à 90 degrés) et sans ressort (ouverture à 180 degrés). Flindersstange: zuerst vom englischen Seefahrer Matthew Flinders angewendete senkrechte, weiche Eisenstange neben dem Kompaß, um dessen Ablenkung infolge von Vertikalinduktion im Schiffseisen aufzuheben (siehe WIKIPEDIA und Marinekompasse). 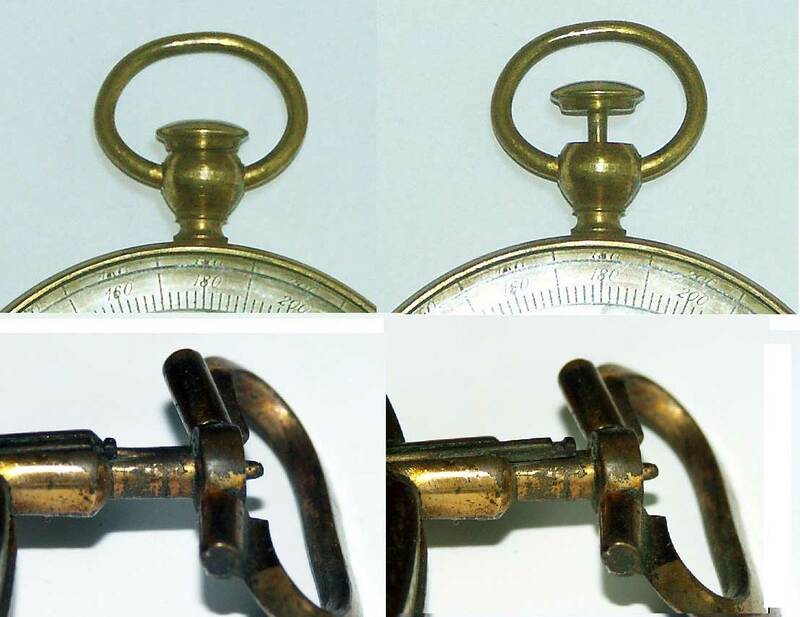 Flinders bar: vertical soft iron bar placed in a tube on the fore side of a compass binnacle. The Flinders bar is used to counteract the vertical magnetism inherent within a ship and is usually calibrated as part of the process known as swinging the compass, where deviations caused by this inherent magnetism are negated by the use of horizontal (or quadrantal) correctors (see WIKIPEDIA) Barreau de flinders: du nom du navigateur anglais Matthew Flinders, barre de fer doux employé dans la compensation des compas pour réduire certaines déviations. "Auch das Spiel des deutschen Jungen von Heute muß schon Dienst am Vaterland sein!" 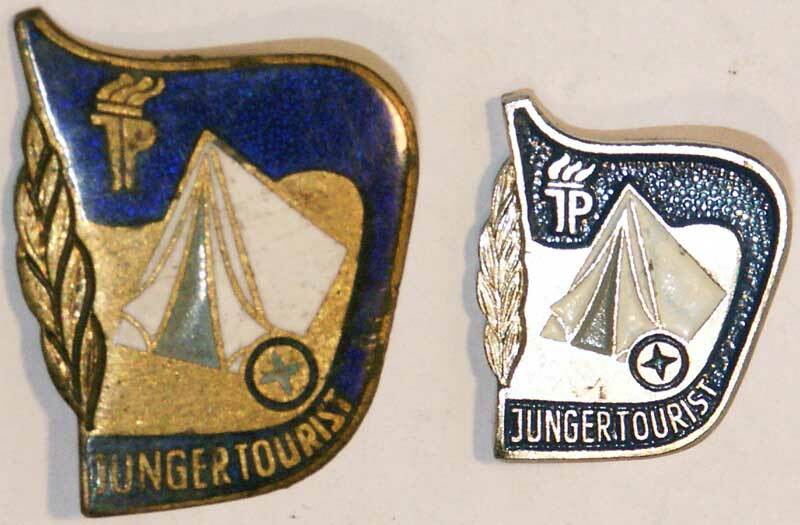 Paramilitary, boy-scout-type youth organisation in the former Nazi-Germany (IIIrd Reich). The german word DIENST means service in the sense of serving the nation. 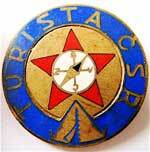 The BUSCH (Rathenow) Jungendienst marching compass was especially developed for such activities. 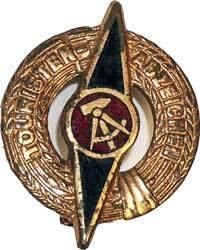 Organisation de jeunesse paramilitaire en Allemagne pendant les années 1920-1930. Le terme DIENST signifie service au sens de servir la patrie, comme service militaire. La boussole de marche BUSCH (Rathenow) avait été spécialement développée pour ces activités. Neusilber, Weißkupfer (u.a. Bezeichnungen - s. Beyars) German silver - An alloy of copper, zinc, and nickel, often in the proportions 5:2:2. It resembles silver in appearance and is used in cheap jewellery and cutlery and as a base for silver-plated wire. maillechort : (de Maillot et Chort, qui inventèrent l'alliage) alliage inaltérable de cuivre, de zinc et de nickel qui imite l'argent. On dit aussi argent d'Allemagne, argentan. Quadrant(-enteilung): Unterteilung des Kreises in vier Viertel von jeweils 90 Grad. Nord und Süd befinden sich jeweils bei Null Grad bzw. Ost und West bei 90°. Manchmal sind Ost und West vertauscht (s. BRUNTON, LIETZ). quadrant: division of the circle in four quarters of 90 degrees each. The zero is always located at North and South, the 90° figure is facing West and East. Sometimes, East and West are swapped (see BRUNTON, LIETZ). quadrants : division du cercle en quatre quartiers de 90° chacun. Le zéro est situé au niveau du nord et du sud tandis que l'est et l'ouest sont à 90°. Parfois, les points cardinaux Est et Ouest sont permutés (voir BRUNTON, LIETZ). A trough compass consists of a long, narrow rectangular box, covered with glass. Inside the box, at its centre, there is a magnetic needle resting on the pivot. At the extremities of the trough compass, there are (sometimes but not always) graduated scales with zero at the centre and marking up to 5° on either side of the zero line. The trough compass is used for marking the magnetic north line on the drawing sheet of the plane table. In this case, the magnetic needle point to 0° - 0° of the graduated scale and a line drawn parallel to the edge of the trough compass is along the magnetic meridian. 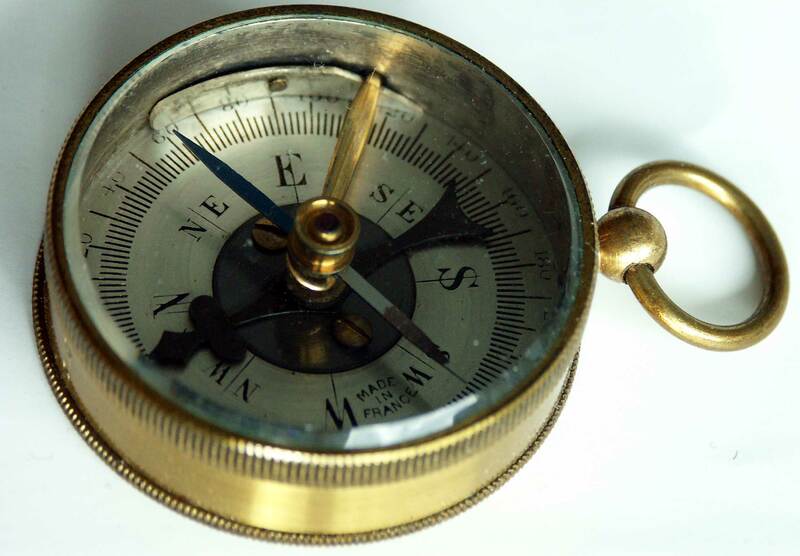 A trough compass is also used to orient the plane table with respect to the magnetic meridian. Boussole déclinatoire : boîter allongé contenant une aiguille très longue mais à débattement angulaire très restreint (+/- 5 ou 10° env.). Instrument servant à orienter une carte qui se se fixait sur les planchettes pour levés topographiques. Le déclinatoire est solidaire d'une planchette (...). Pour décliner l'appareil, on fait tourner la planchette jusqu'à ce que l'aiguille vienne entre les repères. Dans ces conditions, la graduation zéro de l'appareil ou le quadrillage de la planchette fait un angle donné avec le nord magnétique et, dans l'étendue d'un petit levé, cet angle restera constant ; l'orientement du zéro se conservera parallèle d'une station à la suivante. Variation / lokale Missweisung (Deviation) wird durch Metallmassen verursacht. Es kann sich um Erzvorkommen handeln, aber auch um einzelne Gegenstände. In militärischen Handbüchern wird davor gewarnt, den Marschkompass in unmittelbarer Nähe von Gegenständen wie Bajonett, Stahlhelm, Seitengewehr (= Pistole am Gürtel) usw. zu verwenden. http://www.recta.ch/de/deklination-und-inklination Deviation – an error induced in a compass by local magnetic fields - the effect of iron around an “active” compass. Deviation sources are magnets, electrical motors, belt buckles, rings, watch cases, watch bands, chains, knives, radios, bolts, nails, rivets, snaps, eyeglass frames, hull of boat, car, cameras, binoculars, batteries, lightning storms and iron ore deposits under one's feet. Déviation - Erreur de positionnement de l'aiguille induite par des champs magnétiques locaux, l'influence d'une masse métallique ferreuse proche de la boussole. Elle peut être causée par toute sorte d'objets métalliques. Dans les manuels militaires on cite notamment la baïonnette, le casque lourd, le pistolet de ceinture etc. Deklination oder Missweisung nennt man den Unterschied zwischen magnetische und geographisch Nord (lesen Sie mehr darüber in Wikipedia). Ermittlung des Alters eines Kompasses anhand des oft eingravierten Missweisungspfeils. Wir empfehlen das Online-Programm des Umweltministeriums Kanadas). Dort, Länge und Breite der Stadt des Herstellers und nacheinander verschiedene Daten eingeben, bis das errechnete Ergebnis mit der Lage des Pfeils am Kompass übereinstimmt. Declination is the difference between Magnetic North and True North. It is also called variation in the aviation and nautical usage. It was sometimes indicated with the letter E (for emendor = correction) on the dial of some sundials in the late 18th C. and by means of a short arrow in the late 19th and the 20th C.
To calculate the declination at a certain place and date, we recommend the online programme of the Canadian Ministry for Natural Ressources). La déclinaison est la différence angulaire entre le nord magnétique et le nord géographique (vrai). Pour plus de renseignements, veuillez consulter Wikipédia. Pour calculer la déclinaison d'un lieu à une date donnée, nous vous conseillons le programme en ligne du ministère Canadien des Ressources Naturelles. Inklination - Neigung einer Magnetnadel bei zunehmender Nähe zu den Polen zum Erdinneren zu zeigen. Dieser Bewegung wird durch das zusätzliche Befestigen eines kleinen Gewichts am Arm, der sich hebt, entgegengewirkt. Inclination (or dip) is the effect of magnetic pull on the needle, the nearer the compass gets to the magnetic North or South pole. To compensate for this pull, some needles are balanced with a counterweight made of thin wire or a strap of aluminum wrapped around one of their arms (see picture below). L'inclinaison est la tendance qu'a l'extrémité d'une aiguille à plonger vers la Terre à l'approche de l'un des pôles nord ou sud. Cette tendance peut être contrée en rééquilibrant l'aiguille à l'aide d'une petite masse (fil ou lamelle) enroulée autour de la moitié qui tend à s'élever (exemple photo au centre : boussole Breithaupt COHEN). Anforderungszeichen: Teilekennzeichen (Tkz) für die Beschaffung eines Instrumentes / Bauteils in der Wehrmacht (bis 1945). "Flieg" stand für Fliegerisches Material (Beispiele: KADLEC, Siemens Lku4). Heute: NATO-Versorgungsnummer (Englisch: NSN - Beispiel CONAT). Former designation of the reference system for military materiel. 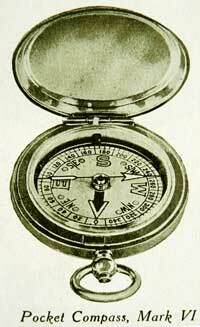 Initially compasses were in Section 6A, but later a new section (6B Navigation) was introduced. Early compasses such as the P4 have a 6A reference, whilst later ones such as the P12 have 6B numbers. Um die Iridium-Drehspitze zu schonen, wenn der Kompass nicht benutzt wird, wird die Magnetnadel mithilfe eines Hebels nach oben gegen die Glasscheibe gedrückt. Es gibt unzählige Systeme zur Aktivierung des Hebels. Das einfachste System besteht aus einer einfachen Kippstange, die beim Schließen des Deckels betätigt wird (Beisp. Bézard). Manche Modelle besitzen fein bearbeitete Stößel (Busch) bzw. Mechanismen höchster Präzision (Muller & Vaucher). In vielen Taschenkompasses wird hierzu eine schräge Zunge seitwärts geschoben. Bei einigen Systemen wird ein durch den Drehknopf im Tragering betätigter Exzenter verwendet. Ein anderes System besteht aus einer in Längsrichtung gleitenden gewellten Zunge mit Längsschlitz. Der Aktuator ist meistens Bestandteil des Tragering-Knopfes oder in ihm eingelassen. An vielen alten Topographie-Kompassen wird der Hebel werden mittels einer Schraube betätigt (Peigné-Syst.). Manche haben sogar eine zweite Vorrichtung (Druckknopf), mit der die Nadel gebremst wird, damit sie ihre Ruhestellung schneller erreicht (Verner System). Auch bemerkenswert ist die einzigartige Lösung vom Triumph-Kompass. In order to protect the (Iridium) pivot against wear, when the compass is not in use, the needle must be lifted by means of a lever and pressed against the top glass (crystal). There are numerous systems for activating the lever. The most simple design is a flat bar tilted by the lid when closing the case (Bézard). Certain models feature a very sophisticated piston (Busch) or even a highly precise mechanism (Muller & Vaucher). A very common design is a lateral tongue depressing the lever's end when pushed sideways. Another system utilizes an excenter actuated by the knob loop. Many levers are screw-actuated (Peigné). Other ones contain a wave-shaped tongue with a long slot. The actuator is usualy a knob in the loop. Pour protéger la pointe en iridium du pivot contre l'usure lors du transport de la boussole, l'aiguille doit être soulevée par un levier et plaquée contre le verre. Il existe de nombreux mécanismes d'actionnement de ce levier. Le plus simple consiste en une barrette-bascule actionnée par le couvercle lors de la fermeture du boîtier (ex. : Bézard). Certains modèles ont un poussoir très sophistiqué (Busch) ou même un mécanisme de haute précision (Muller & Vaucher). Un dispositif courant est une simple tirette latérale à plan incliné. Un autre système consiste en un excentrique actionné par le bouton situé dans l'anneau de transport. par une languette ondulée fendue en son milieu coulissant sous l'action d'un bouton formant la tête ou noyé dans le col de la bélière. Sur de nombreuses boussoles de topographie anciennes, le levier est actionné par une vis (Peigné). Un certain type de boussoles présentait aussi un deuxième dispositif à bouton-poussoir généralement latéral permettant de freiner les oscillations de l'aiguille pour qu'elle puisse rallier plus rapidement sa position de repos (voir Verner). A noter aussi la solution ingénieuse de Triumph). Method of determining one's own position on the map by taking the respective bearing to at least two marking points in the landscape and drawing the corresponding lines on the map. The present position is located where the lines cross (visit also the website compassdude). Méthode permettant de déterminer sa propre position sur la carte en mesurant le relèvement de deux points marquants dans le paysage et en les reportant sur la carte. La position propre se trouve au point d'intersection des lignes. Method of finding out the position on the map of a marking point by taking a bearing to it from two different own positions in the landscape and drawing the corresponding lines on the map. The marking point's position is located where the lines cross (visit also the website compassdude). Méthode permettant de déterminer la position d'un point marquant sur la carte en mesurant son relèvement à partir de deux positions propres différentes connues et les reportant sur la carte. La position de l'objet se trouve au point d'intersection des lignes. The word tourist designated in English and other European languages (also written Turist in German and турист or in Russian) before WW II and until the End of the Communist regimes an ambitious hiker, who knew how to use a compass and a map in a landscape without direction panels! The German word Skitour still designates today cross-country skiing. In its catalogue for compasses for the late 19th century, the BARKER company offered a "HEIGHT RECORDER for Alpinists, Automobilists, Aeronauts, Cyclists, Tourists, etc." 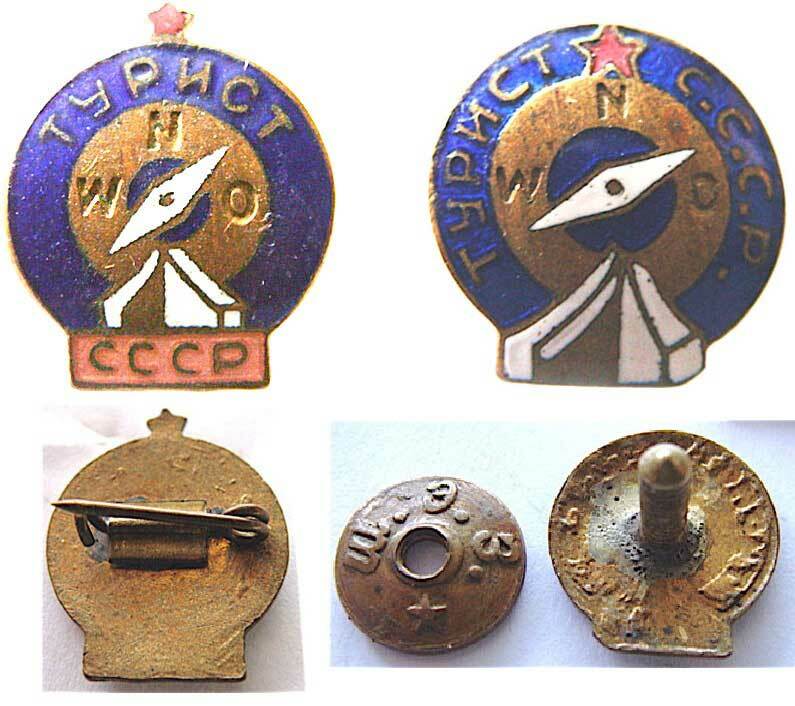 (See picture of the same item made by the German company LUFFT in the Thirties in the category MARCHING compasses and the instruments made by "S" C. Stockert). In the former Soviet Union (USSR / CCCP), East-Germany (GDR) etc., young sportsmen were awarded specific medals (see table below and also Wikipedia in German language : Leistungsabzeichen für Jugendliche in der DDR). 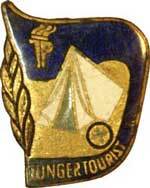 The Junger Tourist (young Tourist) was not at all a young tourist as we understand it today! He or she was someone who could perform several technical tasks like experienced girl or boy scouts, from putting up a tent to orientate herself or himself with a compass to recognize animals and flowers etc. Picture at left: pub sign in Franconia, Northern Bavaria "THE TOURIST"
The torch in the upper left corner is made of the letters JP, the abbrev. for Junge Pioniere (young pioneers) the state's communist youth organization FDJ = Freie Deutsche Jugend (see in Wikipedia 'Free German Youth'). ATTENTION ! 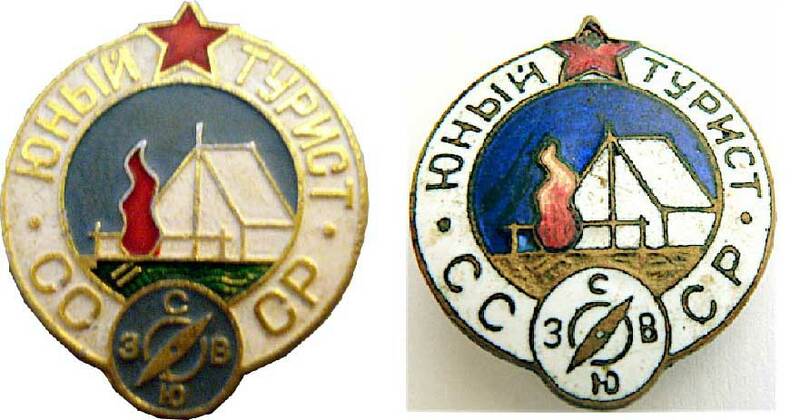 FDJ's medal for COMPASS COMPETITION: This medal was not the prize for an orienteering competition but for political commitments and efforts (link to a German forum)! Transl. : The pioneer must be able to read a map, know the main symbols of the legend on maps with different scales (1/25,000 and 1/100,000), orientate the map, determine a marching course using map and compass and hike for 3km. The word Mark (short 'Mk') followed by a figure (arabic or roman numeral) or even the figure alone appears on numerous pocket and marching compasses from the late 19th century on until to-day. We have no evidence of pocket compass numbers below Mk. 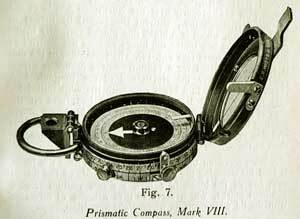 V but there was a Mark IV marching compass (see below). "This compass is of the watch type with a dial 1 9/32" diameter and has recently been improved. It differs from the Mark V in that the dial is graduated every five degrees instead of points of the compass and figured every 20 degrees." (He was referring to the Singer's patent design which featured only 32 points and half points, i.e. only 64 possible angle values in the whole). "Also the North point is marked by a radium-painted luminous arrow, the E. S. and W. points by luminous letters and every intermediate 30 degrees by luminous dots. Instead of the lubber mark a black hair line is drawn across the glass, near the ends of which are radio-luminous marks, one being arrow-shaped. This instrument is accurate within three degrees." (Examples of Mk VI pocket compasses: DENNISON , LONGINES, W. TERRASSE, PLAN and an unsigned wrist-top compass). In the late 19th C. a technological transition took place with the introduction of the much more precise prismatic system. The first version known was signed by F. Barker and featured a Singer's patent card. 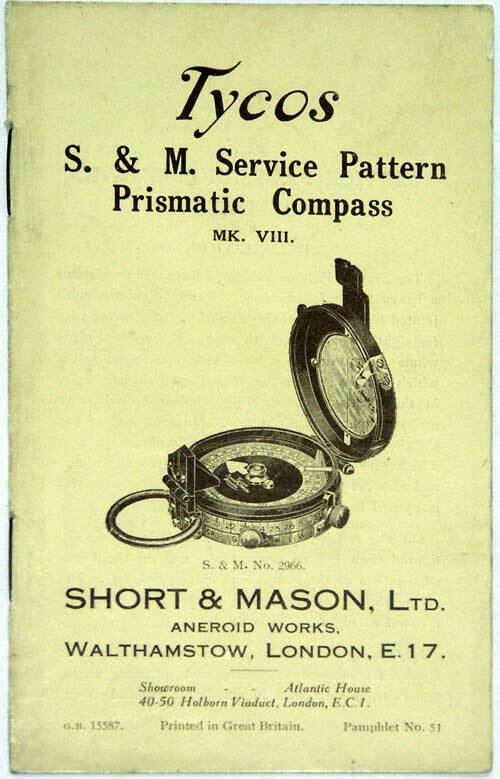 While a non prismatic marching compass designated Mark III was still produced in 1887 by J. H. Steward and called "VERNER COMPASS" the first prismatic VERNER'S pattern was numbered Mk IV (Newton & Co.). 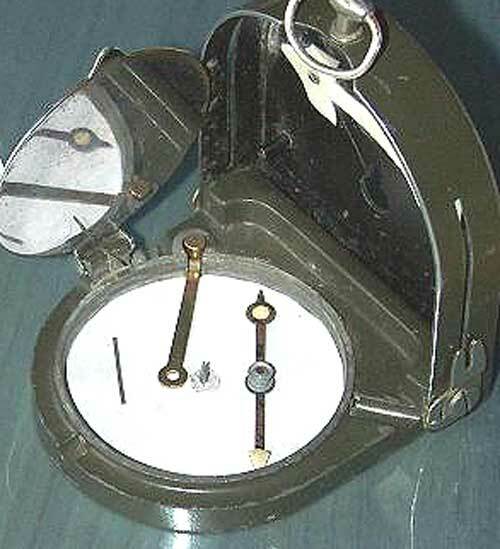 It was soon followed by the models Mk V and Mk VI (for examples go to Compass collector). The next higher figure was Mk VII (description: see Ed. KOEHN). This instrument was equiped with a plunger on its side with which the card's movements could be slowed down. In addition, it featured on the opposite side a card locking lever. It was quickly followed by the Mk VIII (fig. left, for descr. go to F-L), the only difference between them consisting in "a knife-shaped clip fixed to the lid so that the act of closing the lid causes the knife to engage in the groove of the sliding screw, and so automatically lifts the dial." (Quoted after The prismatic Compass, by P. Deriaz). A facsimile of original User Instructions can be ordered (click HERE to see a photograph of page one). 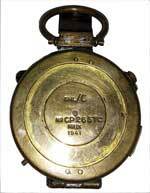 In 1930 F. BARKER & SON developed a new compass equiped with a fluid-damped disc which was called Mk II. Soon after this, in 1932, the model Mk III was created and remained in use until after WWII. 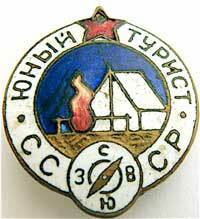 Many manufacturers like T.G. Co. Ltd, but also C.K.C (Canadian Kodak Company), E.A.C., SHL (...) etc. also produced Mk III compasses. However, when the serial number contained the letter 'B', it meant that these instruments were in fact manufactured by Barker and these other companies were only pretending being competitors. 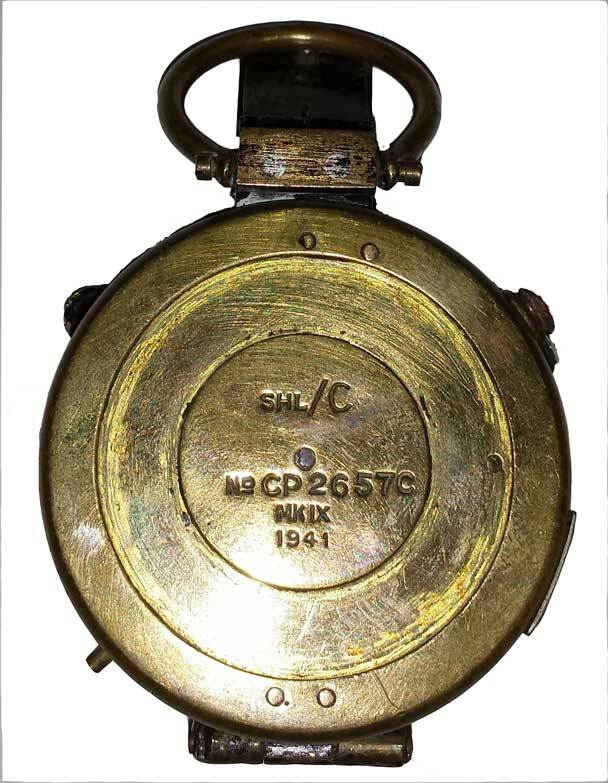 These companies had also produced at the beginning of WWII a compass designated MK IX which was identical to the Verner's pattern Mk VIII but without this name being mentioned since the patent protection had finished. The case featured a black paint coating unfortunately scratched off on the item displayed at right. 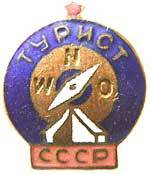 In the last WWII year, a square-shaped dry compass called MARK 1 was produced, signed by T.G. Co. Ltd. and made of black bakelite. Thee MK3.A is a later version of the MK III made in Australia (and in India?) after the patent expired. Glauser produced in the 1970's a cylindrical liquid damped compass called Mk.4, based on the Mark III's design. SISTECO also produced a MARK IV called M-71 model. 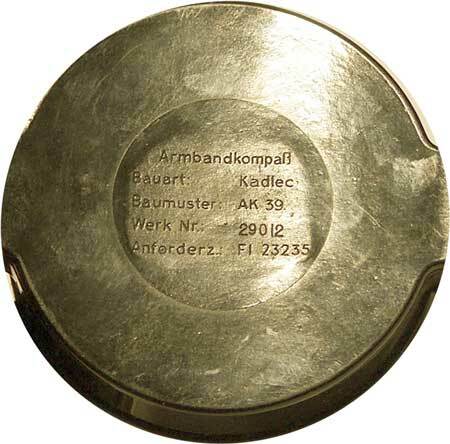 After WW2, Barker gave their compass versions the number of the year during which they were developed (Mk-71 in 1971, Mk-72, Mk-73 etc.). The last development was the Mk-88. NOTE: For more details concerning all the Barker models (e.g. pattern 42, Mk IX, Mk X) and their chronology, please visit the excellent website TRADEMARKLONDON.com (see also LINKS/F. BARKER). The British MOD defines its requirements for supply of instruments, weapons, equipment, by the issue of patterns. Any supplier may manufacture and offer such items for sale, but those items will be examined and certified as type-approved, i.e. they comply with the official pattern. A pattern number is purely a mark of compliance to a standard set out by the Ministry of Defence, and not a mark of who may have manufactured or sold the item. The rotation axis of the Earth defines the geographic North and South poles. This theoretical line can be "seen" at night in the sky: it goes past the Polar star (by approximately half a degree). The magnetic poles are created by the Earth's molten iron core. The discrepancy between both was discovered by Colombus but since he had an immense confidence in his compass, he thought, the stars had changed place. The angular difference between both is called declination. This angle is being measured since the 16th century. Ancient recordings made in Paris and London (see list below) show that the magnetic pole as seen from Europe apparently moved within 25 degrees West and 5 degrees Est. This information appears on maps (direction and rate of change at a defined moment). It is also taken into account on compasses: either by means of a small arrow besides the geographic North mark (see MORIN) or of an adaption device (see HUET). In vast regions near the magnetic pole like North America, the need for adaption is far greater and compasses usually feature a range of approx. 32 deg. West to 32 deg. East (see LIETZ). As seen from Europe, both poles are currently located almost on the same line, i.e. the declination equals zero (half a degree in Paris) while it still was approx. 10 deg. West during WW1 (see NOTE in the cover of a compass). The magnetic North pole's position was first discovered in 1831 by James Clark Ross and Roald Amundsen observed in 1904 that this location had changed. 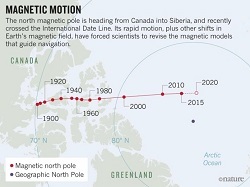 The Canadian Government has been measuring the pole's position regularly since 1948. 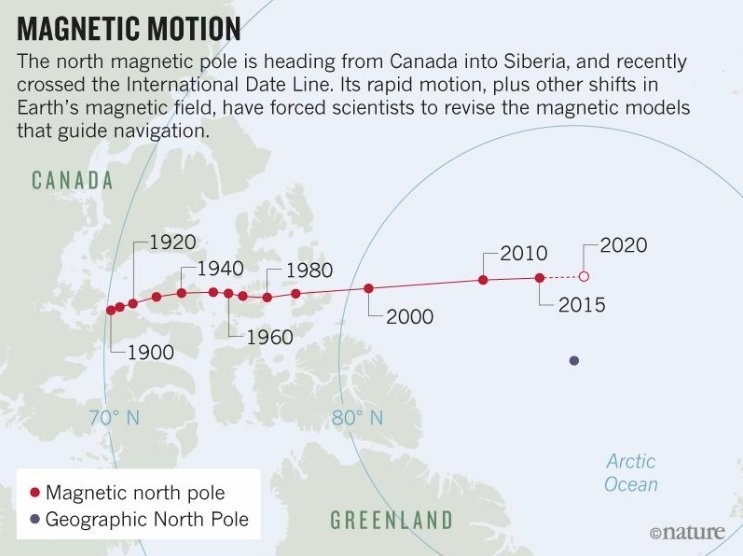 The magnetic pole keeps moving North and will go past the geographic North pole and reach the Russian island of Severnaya Zemlya in 2050 based on the current speed and rate (see at right). - 1580 : East (no value). - 1618 : 3° 3' West. - 1874 : 17° 30' West. To compute the magnetic declination at any position and date (in the past) use the National Geophysical Data Center's calculator. London, February 2010 : 2.6 east, increasing each year by 0.7 deg.